English ivy is a tree-strangler. When this invasive vine creeps up tree trunks, its rootlets burrow into the bark, causing fungus and decay. Eventually the enormous weight of the ivy can topple a tree. 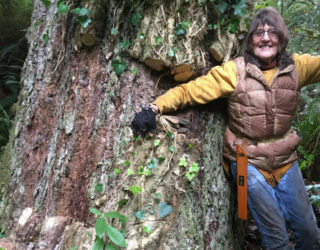 Vaughn Martin and Penny Abegglen of Clatskanie have made elimination of ivy on native North Coast trees a personal quest. So far this year they’ve killed ivy on 107 trees in two NCLC habitat reserves on the Warrenton peninsula, exceeding their own goal. “We didn’t start out the year with a goal of 100, but about a month ago I saw that we were at around 75,” Martin says. “We then decided to go for 100.” That total doesn’t include the 12 Sitka spruces that they liberated from ivy during a stewardship-by-canoe trip to The Nature Conservancy’s Blind Slough Swamp Preserve near Knappa in August. It’s hard work: they use loppers and saws to sever the vines (which can be as thick as your arm) from their roots in the ground; the vines above die and are no longer harmful to the tree. The Daily Astorian featured our ivy wranglers on Nov. 30. I really must comment. What a great year it’s been getting to know these two wonderful people as they joined the NCLC. Family. This is the future, people who care loving the land and realizing they can make a big difference. It’s not just ivy for Penny and Vaughn, but also purple loosestrife, policeman’s helmet, seedbombs and more!